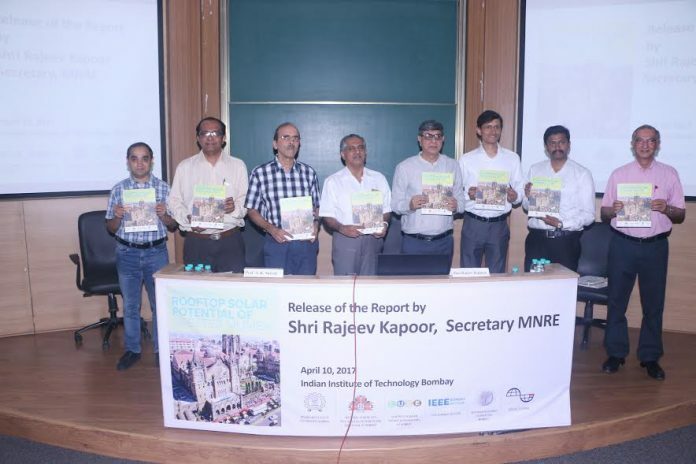 Mumbai: Mr. Rajeev Kapoor, IAS, Secretary of the Ministry of New and Renewable Energy (MNRE), visited the Indian Institute of Technology Bombay today to release a Report entitled, “Estimating the Rooftop Solar Potential of Greater Mumbai”. The National Solar Mission of the Government of India envisages an ambitious target of 100 GW of solar energy to be installed in the country by 2022. This would not only provide a green and clean source of energy for the country and provide access to electricity in remote areas but also enable India to meet its commitments made at COP-21 in Paris. Of the 100 GW, it is planned that 40 GW would come up on rooftops across the country. With the cost of solar energy having come down significantly over the last few years, and most states having implemented net-metering policies, rooftop installation has become very viable. Many urban as well as semi-urban areas can generate a lot of power. In order to assess the solar rooftop potential of Greater Mumbai, and to simultaneously develop a methodology that could be used anywhere in the country, five organizations got together to work on this problem. They are the National Centre for Photovoltaic Research and Education (NCPRE) at IIT Bombay, the Centre for Urban Science and Engineering (C-USE) at IIT Bombay, the Observer Research Foundation (ORF), Bridge to India and IEEE Bombay Section. Each entity provided a unique capability and expertise which made the work possible. The team employed a variety of inputs and techniques, include GIS mapping of all structures in Mumbai, ward-by-ward division, existing land use (ELU) maps of BMC and 3D mapping to discount areas covered by shadowing. The computer based analysis was supported and verified by site visits to some locations (conducted by student volunteers), and discounting of ‘weak’ structures which would not support solar panels. The result of the exercise is that the team could show that Mumbai has a potential of 1,720 MW of solar energy across rooftops on residences, educational institutions, commercial buildings, government buildings and industry. Furthermore, the team used only open-source software and have described the methodology in detail, so that a similar study could be replicated in urban and semi-urban areas across the country.